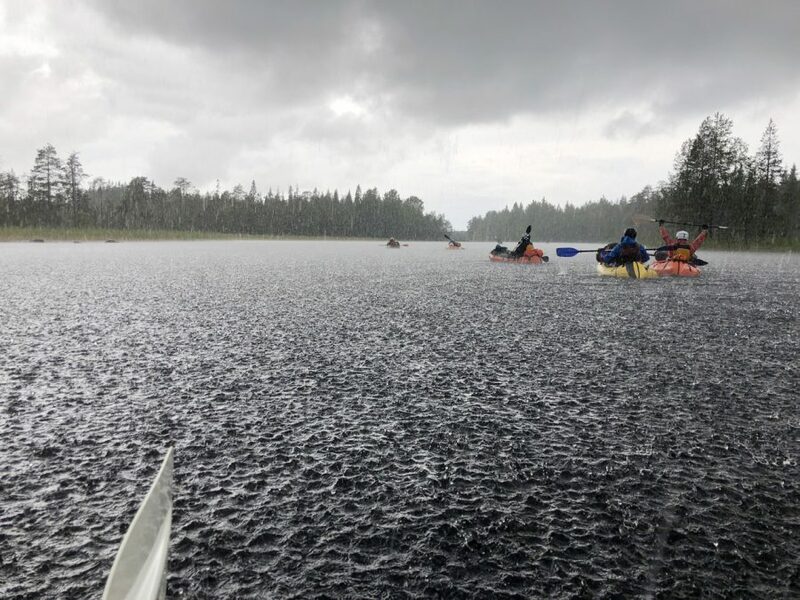 It seems strange, but one day of paddling on the lake was more than enough to get us all tired and wanting to have some rest (see Part 1). 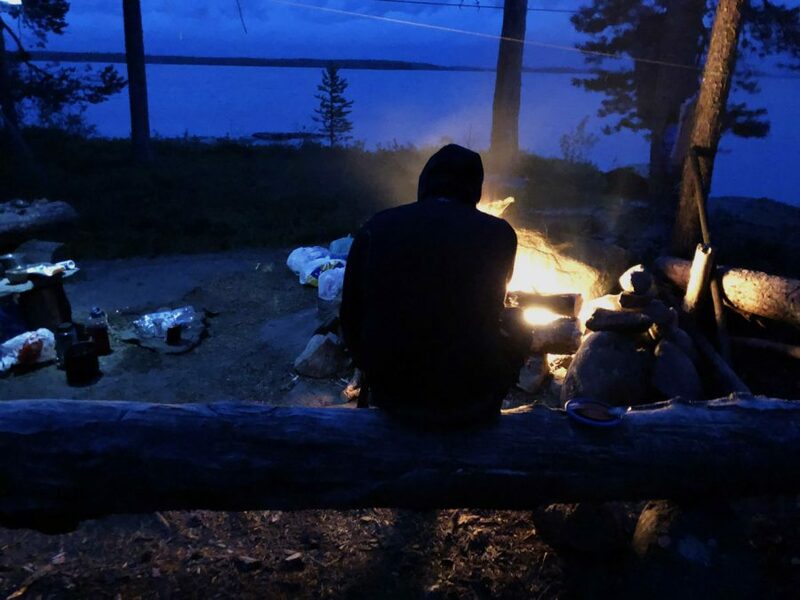 Which is why everyone was more than happy to spend the second day of our 11-day adventure on the Oleniy island, fishing, picking berries, doing some camping chores, exploring the surroundings, sleeping, talking and just simply relaxing. As one of the guys said – “Eventually, these are my holidays as well.” It would have been nice to have good weather, but we were content even with clouds and wind. 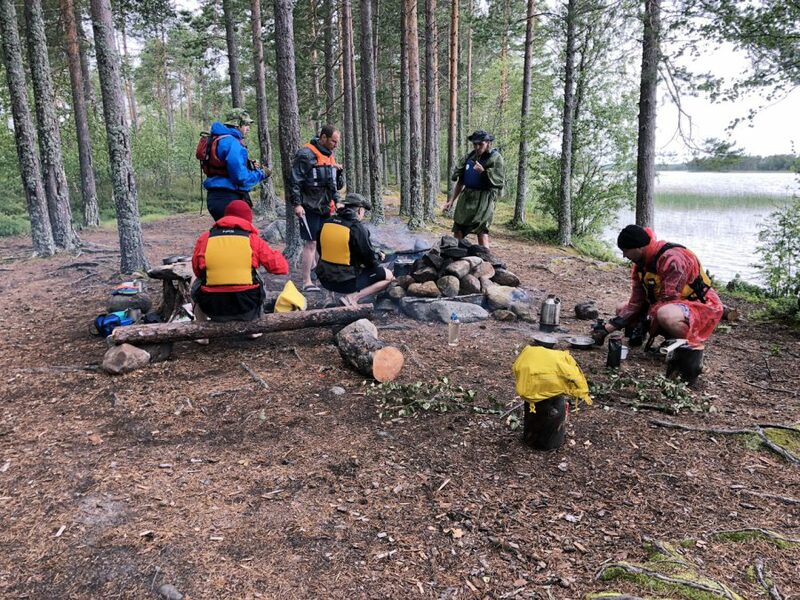 The place where we set up our camp was on a small cape, surrounded by water with a fire ring and a large uprooted pine tree forming a bench. Two more tree trunks placed on the stones formed another bench. Or a table – it all depended on our needs. Under the pine trees small berry bushes and moss covered the thin layer of the soil over the rocky underground which formed the foundation of this island. Usually, most of this would have been rather wet. But due to the heat and complete lack of rain for several previous weeks, everything was absolutely dry. This meant that usually abundant edible mushrooms were nowhere to be found, regardless how much I searched. 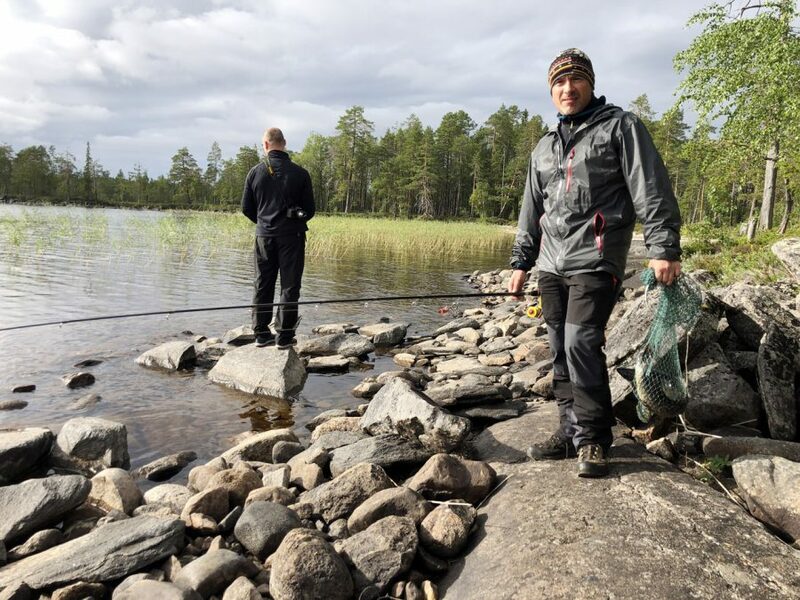 And this was a bit of a problem – when preparing the food for the trip, Ilmar, Dobrusha and Sashuk counted on extra protein supplements in the forms of mushrooms and fish. And I failed to deliver my part of the deal (I was tasked with the mushroom picking). 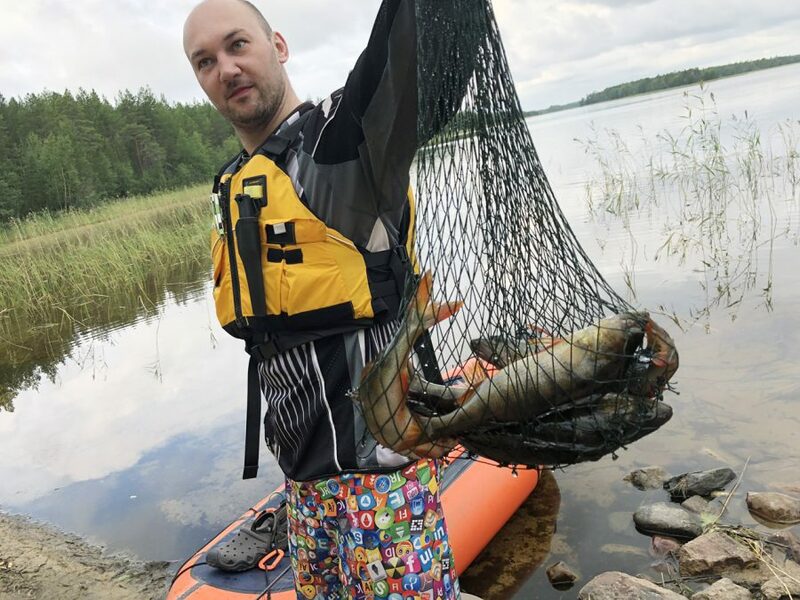 Fortunately, Sashuk and Vadim, who were responsible for fishing, had more luck than me. At least Vadim did. 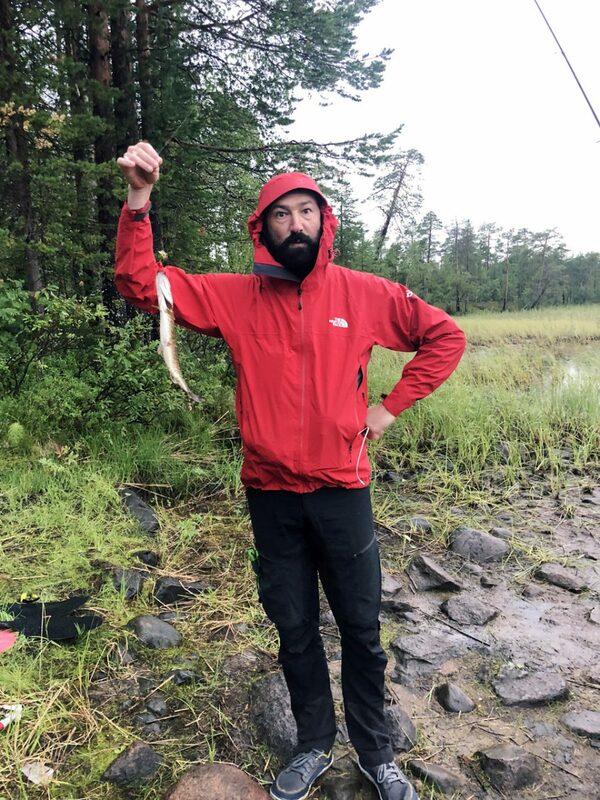 After the failed attempts in the morning, he brought a sizable pike and a big perch, which were turned over to Lev, who quickly and deftly dealt with them and, thus, earned himself a nickname Lev the Reaper for the rest of the trip. We were also lucky with berries. Dobrusha and I found some alpine and regular blueberries growing on the southern shore, which were nicely ripe due to the abundance of sun. But most of the berries around were cowberries, which we were not really familiar with as they are not common in our latitudes. 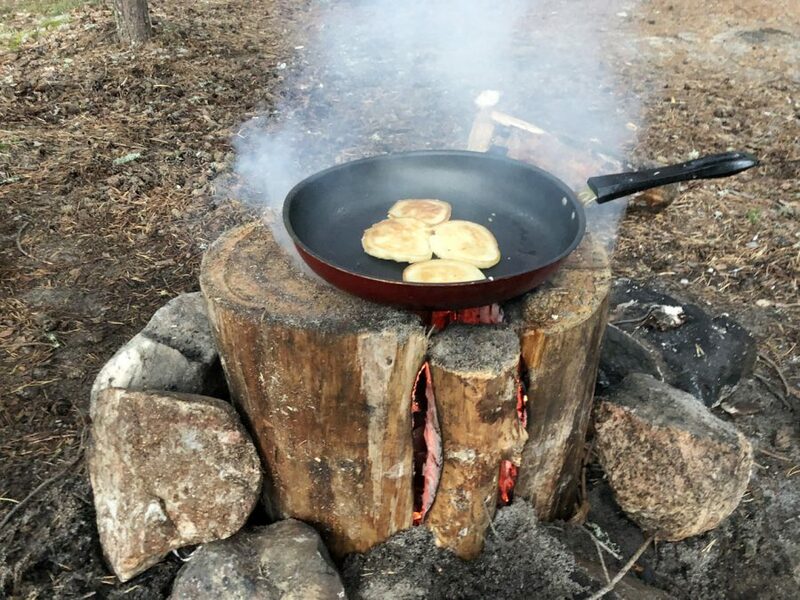 So, we had to confirm that they were edible – good thing that the internet was still working. 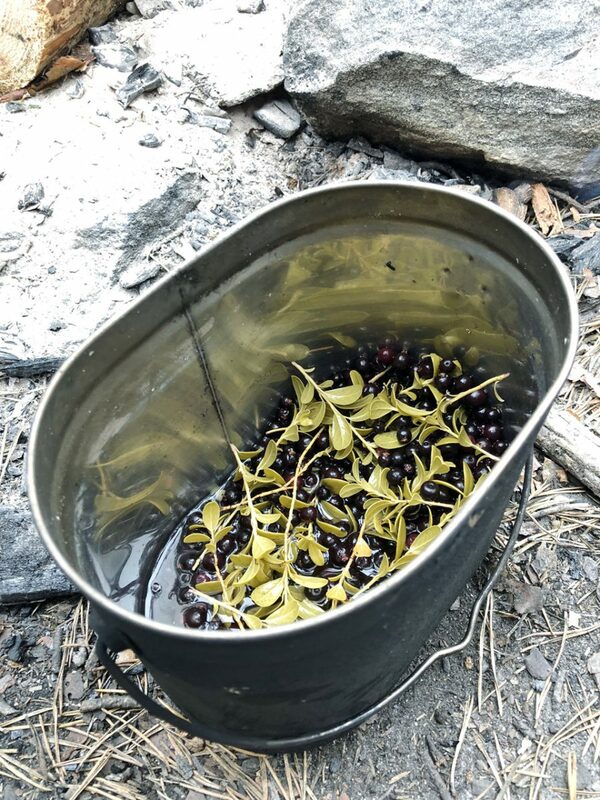 While bland when eaten raw, cowberries made really nice drink when boiled together with some blueberries and blueberry leaves. Later we read that such a drink could help with overexhaustion. 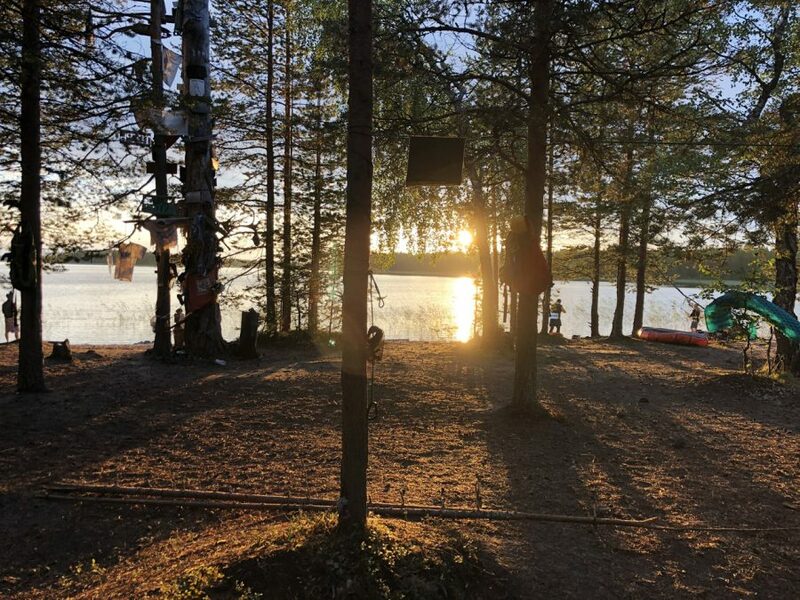 I guess we got lucky as we really needed to regain strength for what awaited us the next day – lake hopping and portaging. The third day started with packing up the camp and paddling south/south east between islands towards a small stream connecting to the next lake. Once we left the open water and entered narrow passages between these islands, the whole atmosphere changed. 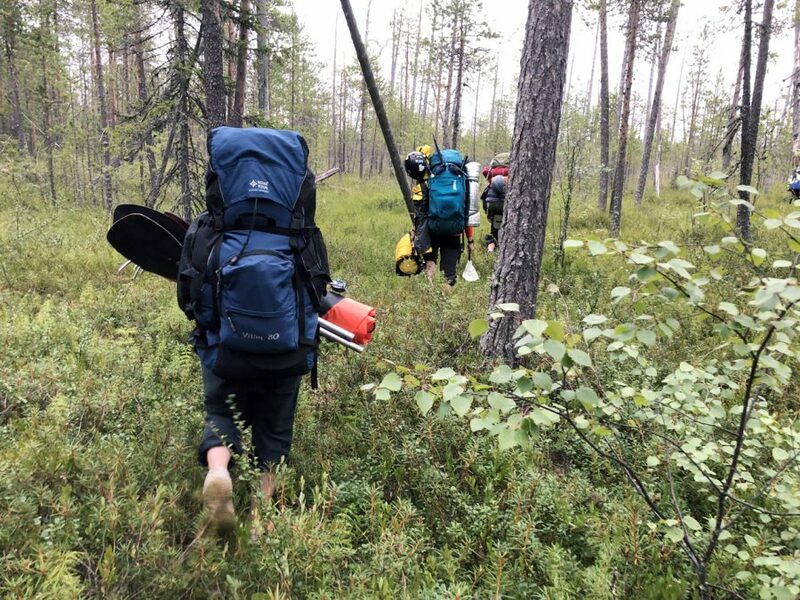 It became less windy and the vegetation became less rough – besides the same pine trees as on the Oleniy island, there were a lot of birches as well. The small stream connecting to the next lake, Lake Sigalambi, turned out to be a former channel used to drive logs in the early 20th century. 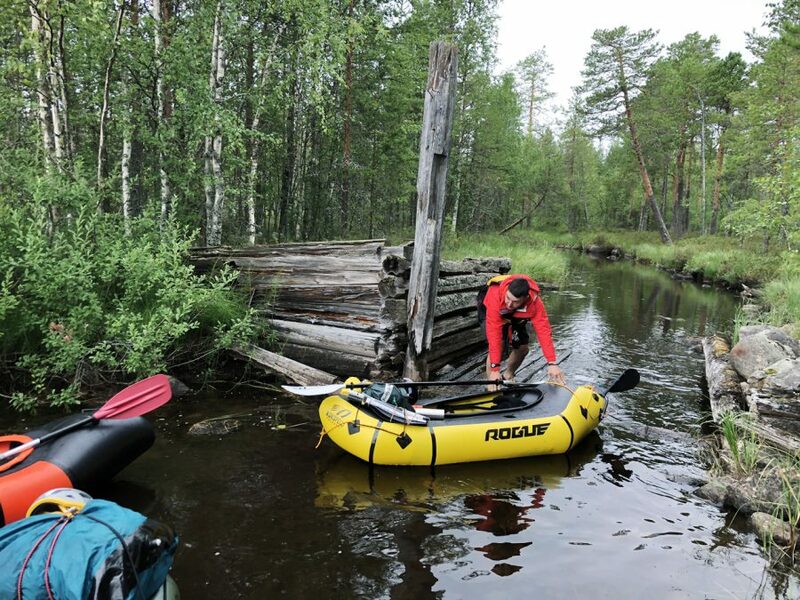 Whereas looking very wild at first, the 650-meter-long shallow stream ended with a semi-collapsing wooden construction that resembled a river lock. It clearly came from the time, when this area was one of the logging centers, with multiple settlements scattered around the lakes. All this is in the long-forgotten past now and only remnants of the infrastructure like this still and occasional indications on maps remind us of the former glory. 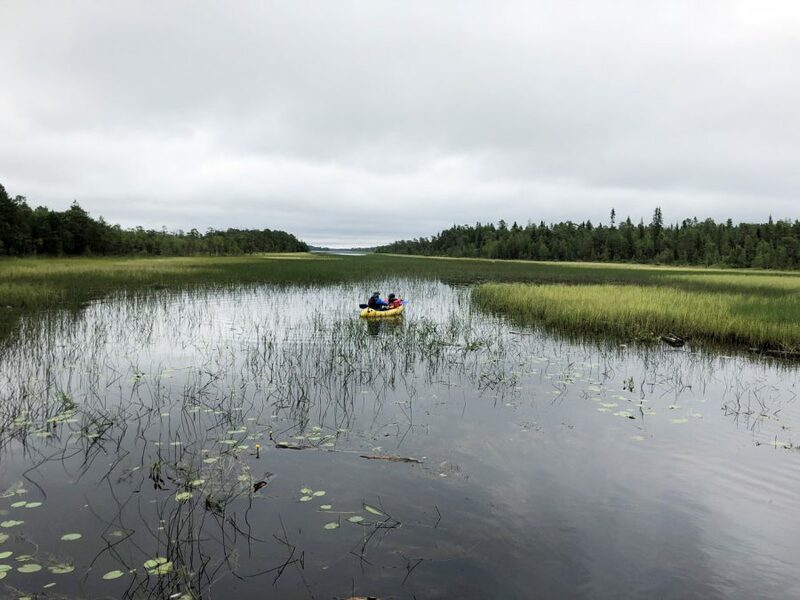 After relatively small Lake Sigalambi, we took another log driving channel to a much bigger Lake Varyagozero, from where we had to portage yet to another lake. 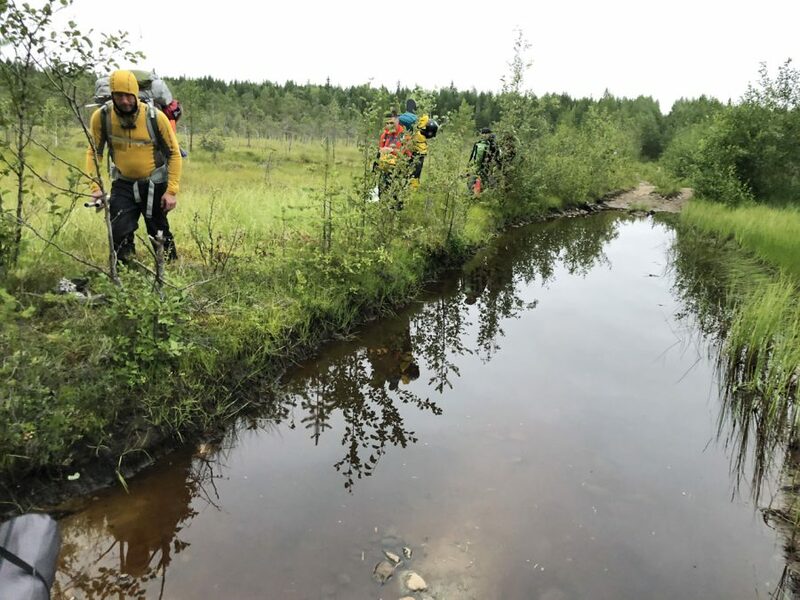 The stream was so shallow and overgrown, that we had to walk most of the time, pushing or pulling our heavily-loaded packrafts under some fallen trees. 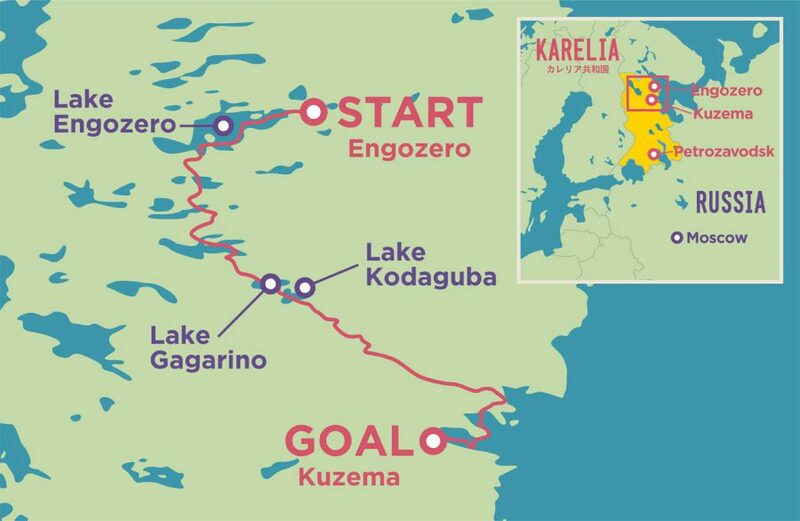 While preparing for this trip, we read different trip reports, checked satellite and topographical maps, and we knew that there was a road to the south of Lake Varyagozero. But the problem was that it was at some distance from the lake and there was not really a clearly visible path going to it. That meant that either we needed to go through the area of dense forest or we had to negotiate what looked like a bog. And we were not certain what the best option would be. That is why we were pleased to see several people next to a small wooden house and another building that resembled a sauna. Il, Ilmar and I jumped out to ask them for directions. To our surprise, one of them was actually the second forests ranger (the friendly one), who we had already talked to in the village on the first day. It was a Saturday and he was off duty there, fishing and, judging by the number of empty beer bottles, enjoying his time. The weather forecast for that day indicated that we would have had heavy rain in the morning, but so far it was cloudy but dry. 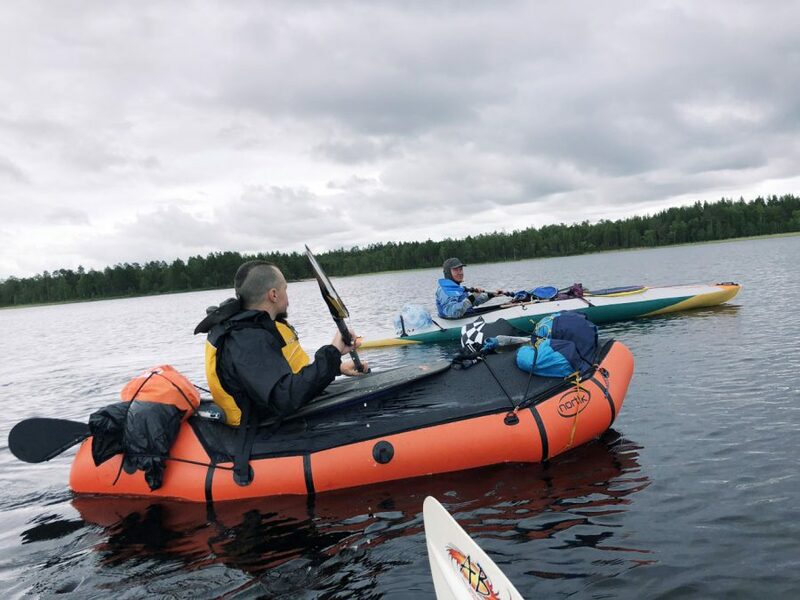 At the same time the wind direction changed again and we had to spend almost an hour paddling against the wind just to cover 2 km across the lake to the beach. The beach itself was long but narrow and was only there because the water level was low. And in the middle of it, there was a large granite boulder to which we decided to land. It was a natural marker that attracted our attention. 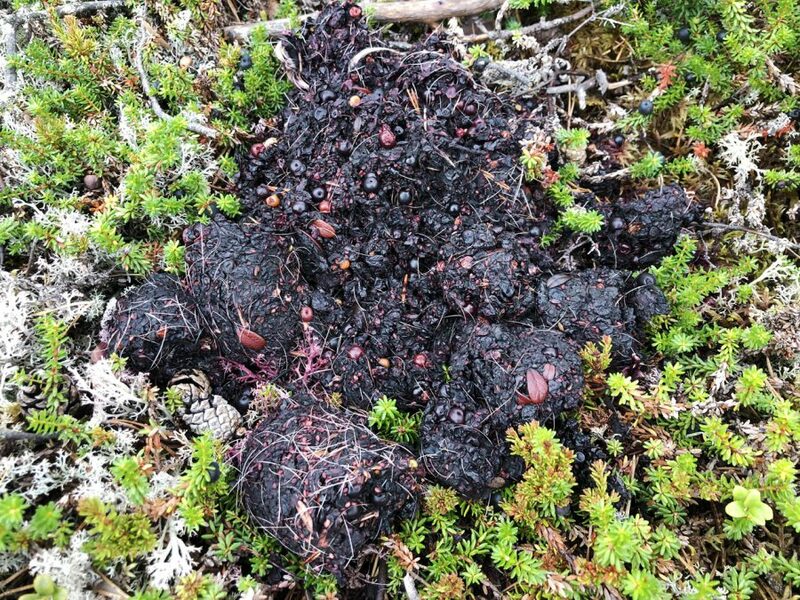 But we were not the only ones who apparently liked that place – just a few meters away from it, there were two large piles of semi-digested berries with some hair in them. One of them looking fresher than the other.“I think it’s bear poop” I said. “Great, we chose a bear toilet for a stop,” laughed the guys. 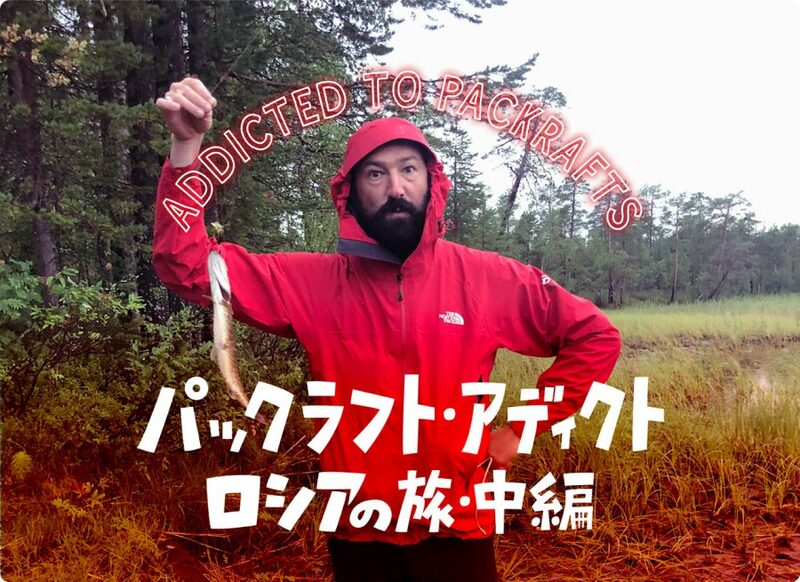 And we carried on packing, changing clothes and preparing for the portage. Jokes aside, I felt that the realization that we were in the bear country noticeably affected us. I, for one, felt that I did not want to be completely on my own. 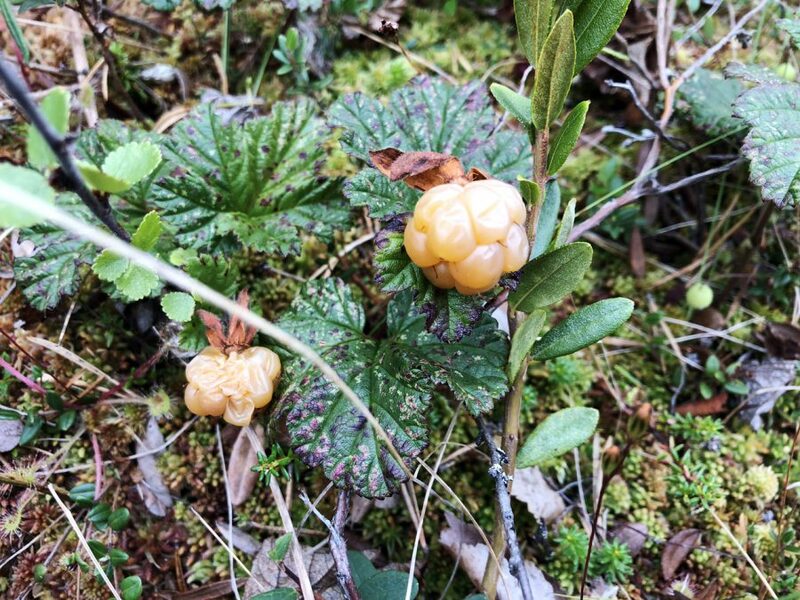 At the same time, it turned out that the boggy area next to the beach was full of cloudberries, the number of which I have never seen in my life. I could not stand the temptation and decided to pick some up. But I stayed close by the rest and started to sing some nonsense about bears in order not come across one and take it by surprise. Which can be very dangerous, as you know. Others had a different approach. While we were repacking and cooking our lunch, Sashuk and Il went to search for that winter road. And in case they would meet a bear, they took some flares, specially brought by Il for such an occasion. Vadim also lit some fire crackers, the noise of which sounded like gunshots. “Usually if a bear hears this, it does not tend to come close to that place any more” he explained. Once the scouts returned, they had some good and some bad news for us. The bad news was that they could not find the winter road the forester talked about. The good news was that it was only 600-700 hundred meters to the main road, which was nice and broad. Encouraged by it, we took our mountain of gear (it felt as if we had more of it now) and started to walk through the almost dried-up bog following some kind of paths. “They are not made by humans, are they?” I asked. “Most definitely not,” replied Dobrusha. The road itself turned out to be very nice indeed. It was broad, elevated and hardened. But it was not very clear if it was often used as there were dear droppings lying on the tracks. 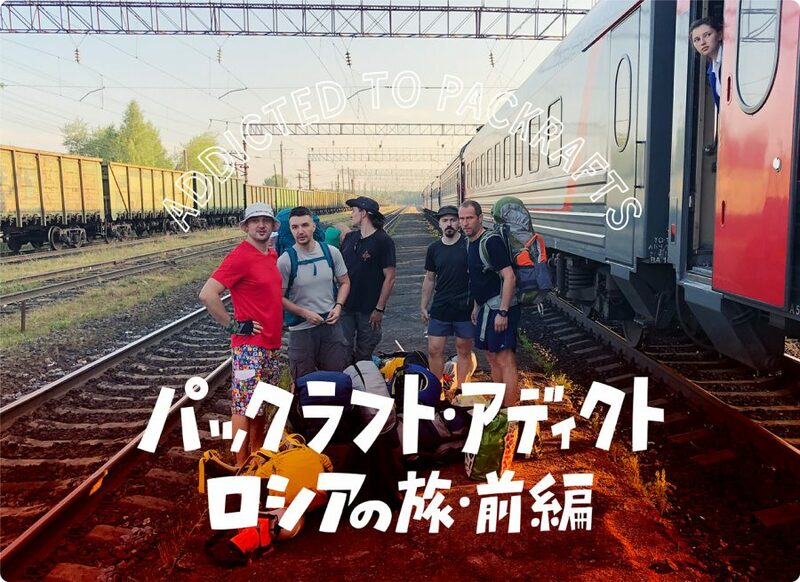 “How far do we need to walk?” we asked Ilmar, who planned the route. 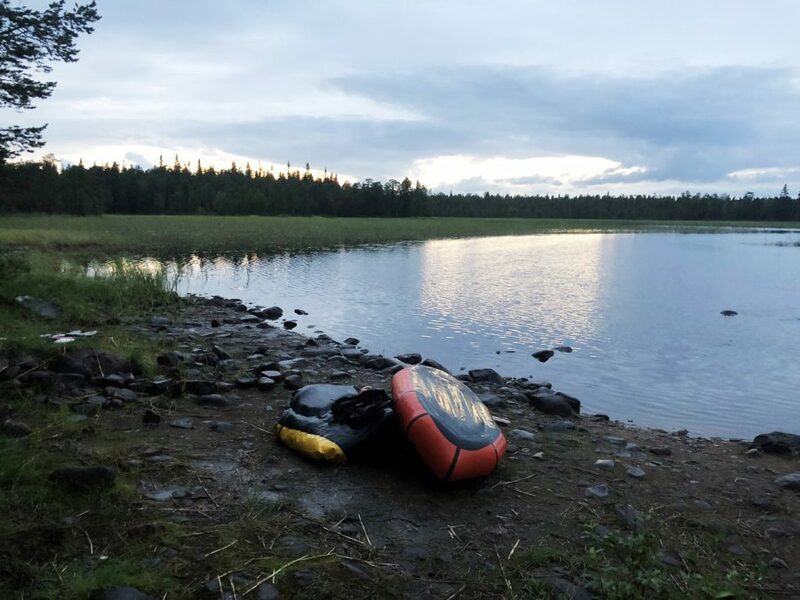 “About 3 km along the road and then a hundred meters or so to a small beach where we can re-inflate our boats again,” he said. And, so, we started our march. About two kilometers into the walk, the first rain drops started to fall. “Strange,” I thought. “The weather forecast clearly said that it would be dry. I am sure it will be over soon.” But still I decided to put my rain jacket on. Some people did the same, while others decided to wait. But before we knew it, the skies opened and it did not just rain but it started to pour. The water ran over my rain jacket and onto my trousers. It got into my rain jacket as well. I was getting more and more wet. At first, I tried to keep my feet dry by walking on the grass between the tire tracks that turned into puddles. But soon I gave up and just walked ankle-deep in the water, concentrating on moving forward as fast as possible. All of us were doing it. No one spoke. All we wanted was to get to the beach, re-inflate the boats and get to the planned campsite. After what seemed an eternity (but in reality was less than 30 minutes) we arrived at what we thought to be a beach, but in reality was nothing more than a patch of reeds and rushes that on a satellite map looked like one. 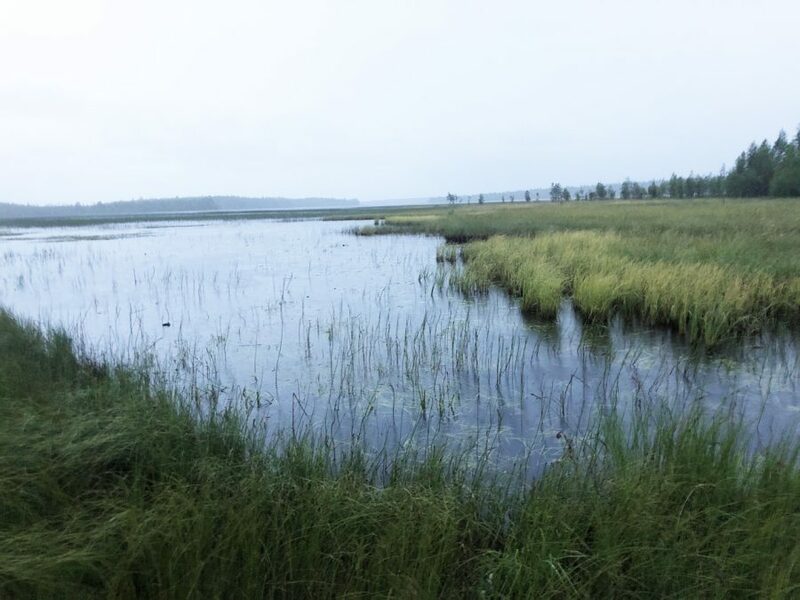 Wet, cold and ankle-deep in mud, we stared at the water in front of us – it was all covered in reeds, which meant that we would most probably get stuck there. What are we to do? A discussion started as opinions differed. Eventually, we decided to get back on the road and walk two more kilometers to the next bridge and try our luck there. 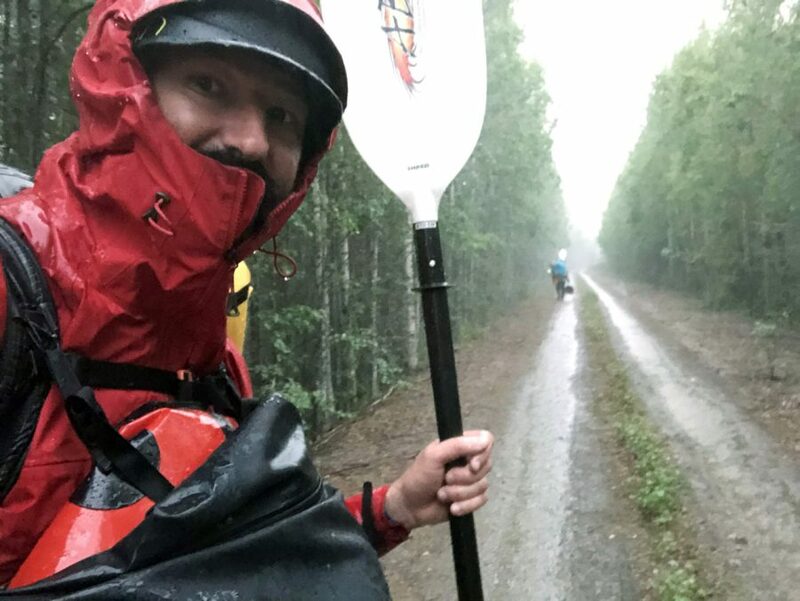 The night approaching and the rain still pouring hard, we continued our march, muttering curses under our noses (I was wondering why it had not crossed my mind to put my drysuit on – it seemed so obvious now). By the time we reached the next bridge, getting back on the water was out of the question. It was too dark for it. And even if we did get on the water – what’s next? But there was no proper camping place either. The area next to the lake was marshy and all that was left for us was the road itself. And that is where we decided to put our camp. Working almost in silence, we set up our four tents (two on each side of the road) and covered the rest of the stuff with a tarp. To prevent us from accidentally being run over, we fell a couple of small trees on each side of the makeshift camp and tied some reflective tent lines to them. “This way, should anyone drive here at night, they would have to slow down and hopefully see us,” we reasoned. All things ready, we crawled into our tents and into our sleeping bags. 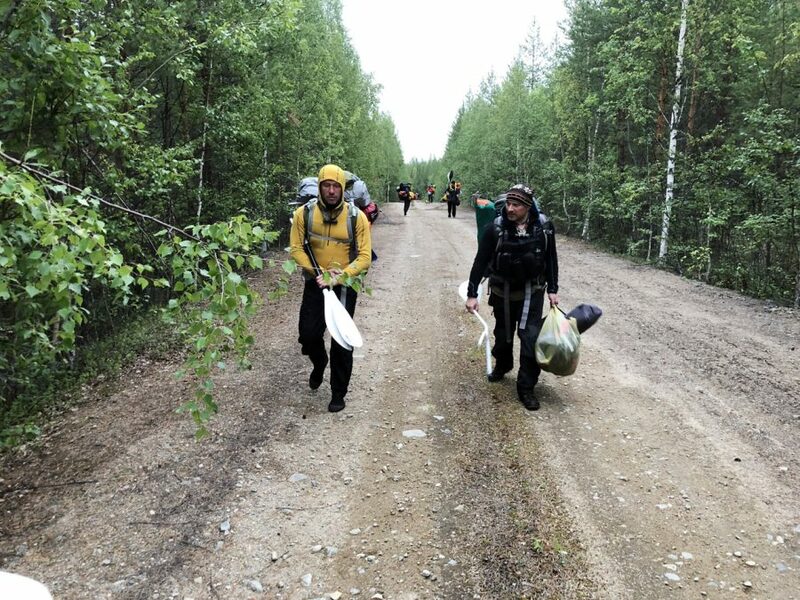 As we did not have an opportunity or will to cook our dinner, we decided that it was the right time to dive deep into our bags and search for the ‘unregistered supplies’ – the extras that were not part of the planned food rations. Usually they are great when the morale is low and tempers are high. And this was definitely a perfect occasion for this. 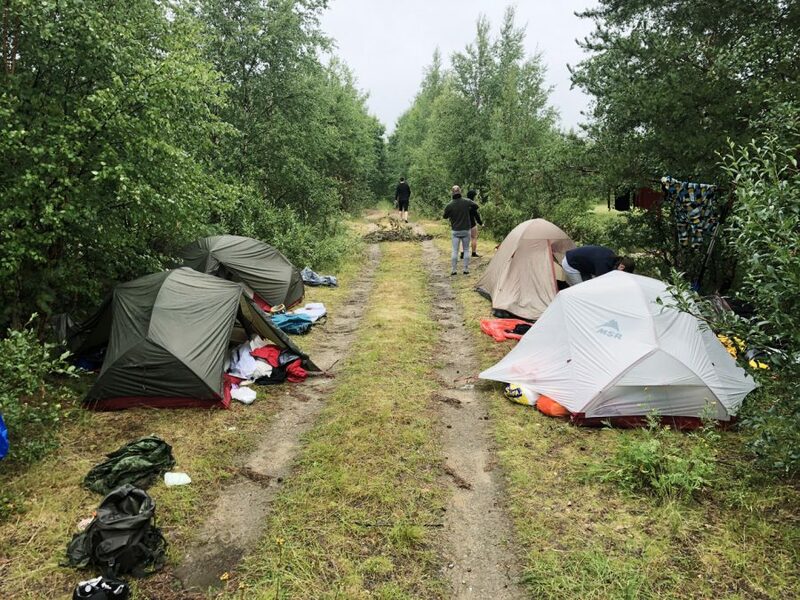 That is why I dug up a package of sausages from Slovakia, and handed it over to my tent-mate, Il, who was the only one still outside and volunteered to be our distribution center. 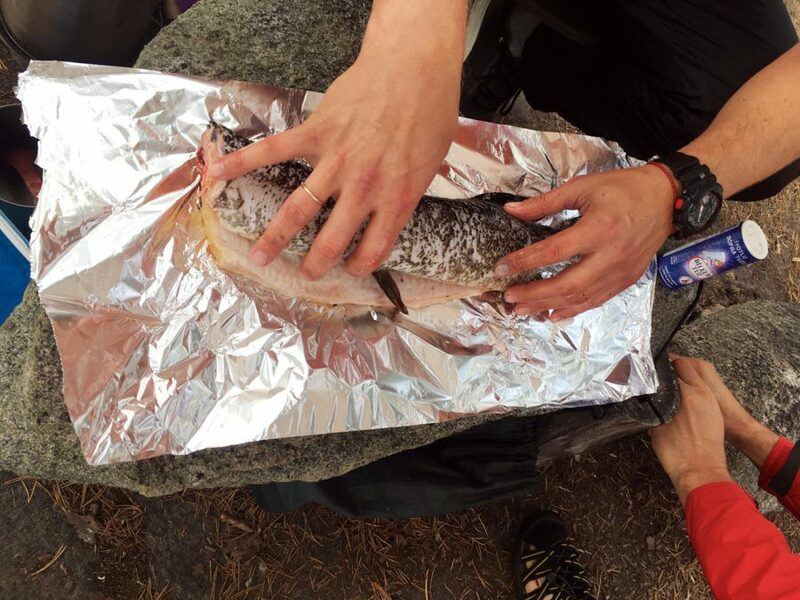 The meat tasted great with honey, dried fruit and muesli bars that others fished out as well. 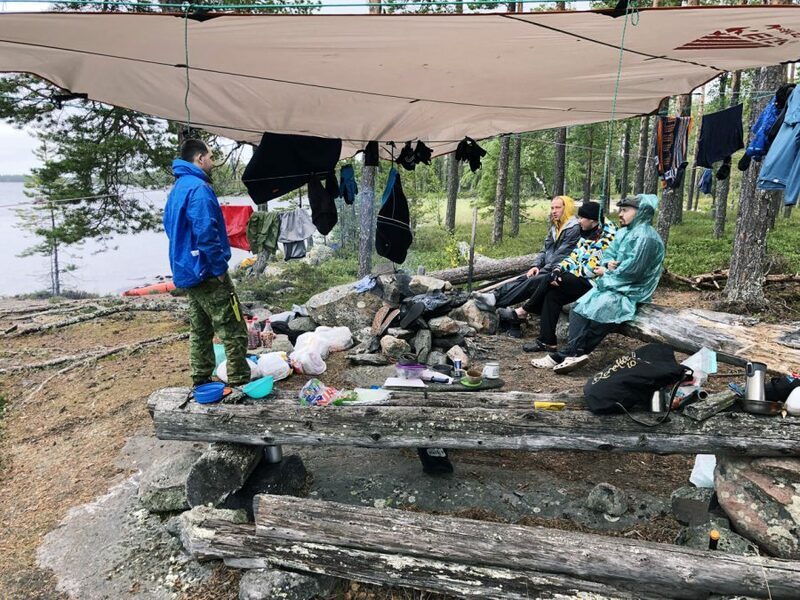 As the rain continued to drum on our tent, I wondered if the next day was going to be the same – eventually, the weather forecast said that it was supposed to rain again. 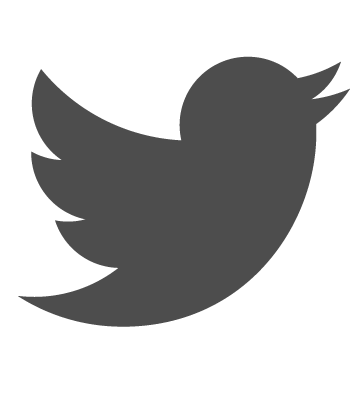 Overnight, something must have happened because our bad luck changed (until lunch time, that is). To begin with, the weather forecast was wrong. Again. But this time, instead of rain, when we woke up, it was dry. Soon after that the sun started to shine, which gave us a chance to dry at least some of our things. Secondly, all our fears of being driven over turned out to be pointless as we discovered that the bridge was broken and no car could have passed. The strange thing was that the night before, we walked over it and did not see it at all. Thirdly, the exit from the bay of the lake, Lake Pildozero, was also covered in rushes. 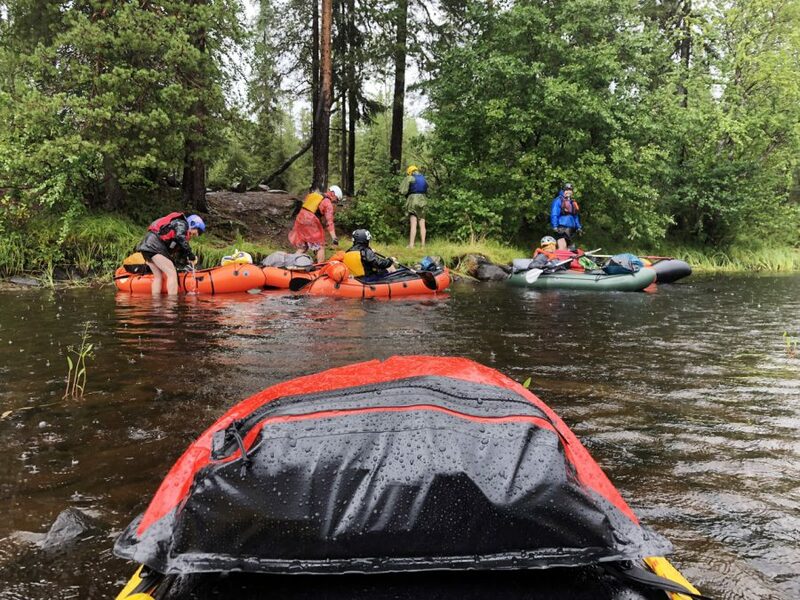 But, when ready for the worst, we approached them, it turned out that it was deep enough for our packrafts to pass without any problem. Finally, the exit from the lake was the place where the Vonga river and the first rapids started. After several days of lake paddling and portaging, we were really looking forward to it. This was, incidentally, the place where we were hoping to camp the night before. After a short break for an early lunch, we scouted the first rapids, which, to be honest, were a bit of a disappointment. At the low water level as we had, our first rapids on the Vonga were hardly more than a handful of stones spread over a couple of dozens of meters. And indeed, going down these rapids was very easy. Still the exhilaration of the moving water made us very hopeful. But not for long, as immediately after the rapids the river slowed down again and the tedious paddling began. The next five kilometers to Lake Sindamozero took us almost two hours. 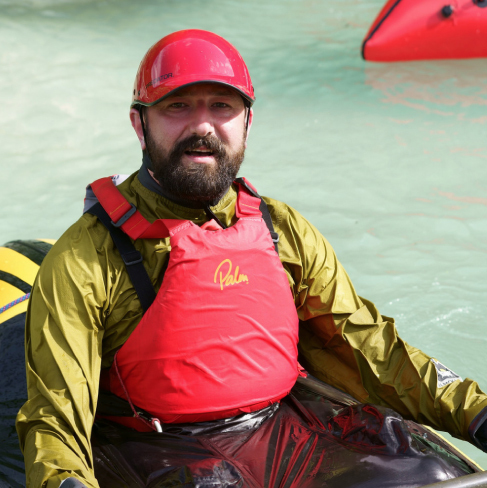 On top of that, Nick, who was paddling the test packraft from Nortik, seemed to have a hole in the bottom of his boat again and he started to get water in the raft. We already fixed some holes after the first day, but now there were even more. 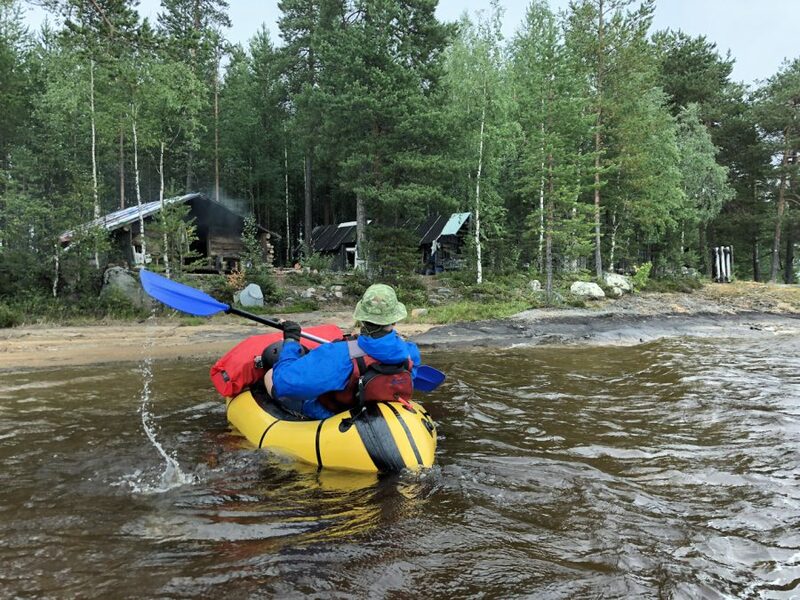 When we reached Lake Sindamozero, we spotted a small group of people packing their kayaks on the shore, who, once ready, quickly caught up with us. 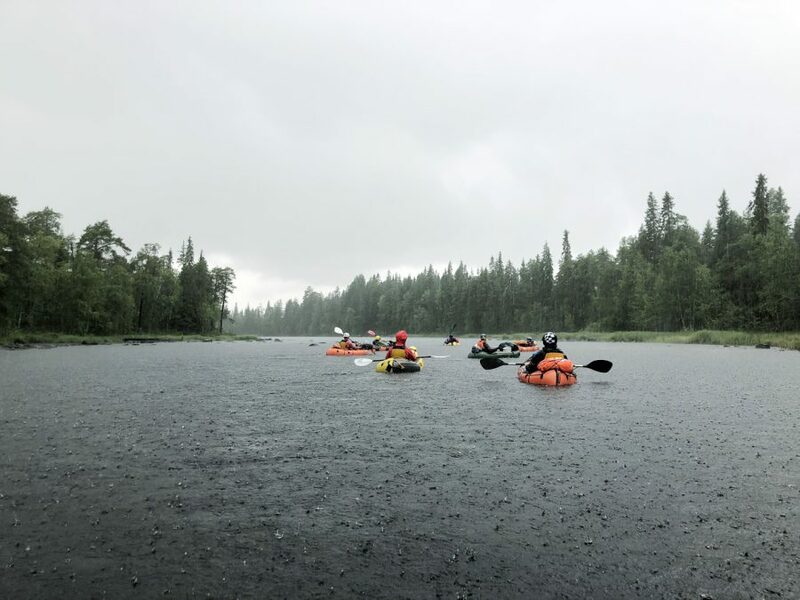 These were three men and a woman in their early 60s, the old Soviet-school of kayaking type. Their three folding kayaks (two doubles and a single) were fully packed. One of the guys, who was alone in a double kayak, asked us if these were packrafts. “Yes, they are,” we answered enthusiastically. “And isn’t it very difficult to paddle on the lakes in them?” he asked. “Yes, it is,” we replied, less enthusiastically this time. It turned out that they were also going to the White Sea and then Kuzema. “So, you are going to the portage point today,” we asked. “Oh no,” he laughed. “It is much easier for us to paddle extra 7 km around the island instead of portaging those 200 meters. It’s faster this way.” And after a goodbye they effortlessly left us far behind. 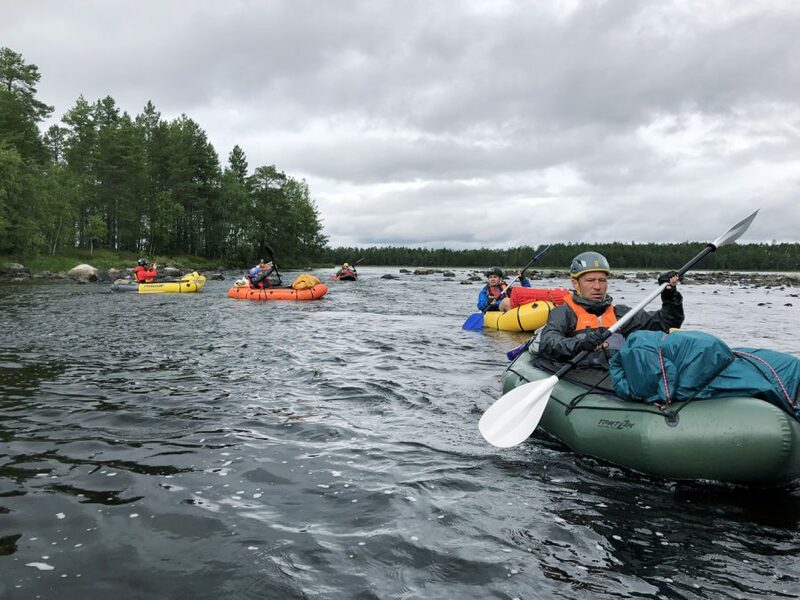 The place we were talking about is a famous place where kayakers and catamaran crews take a shortcut by portaging a short distance over a narrow but a very long peninsular, instead of going around it. And this was exactly where we were going next. 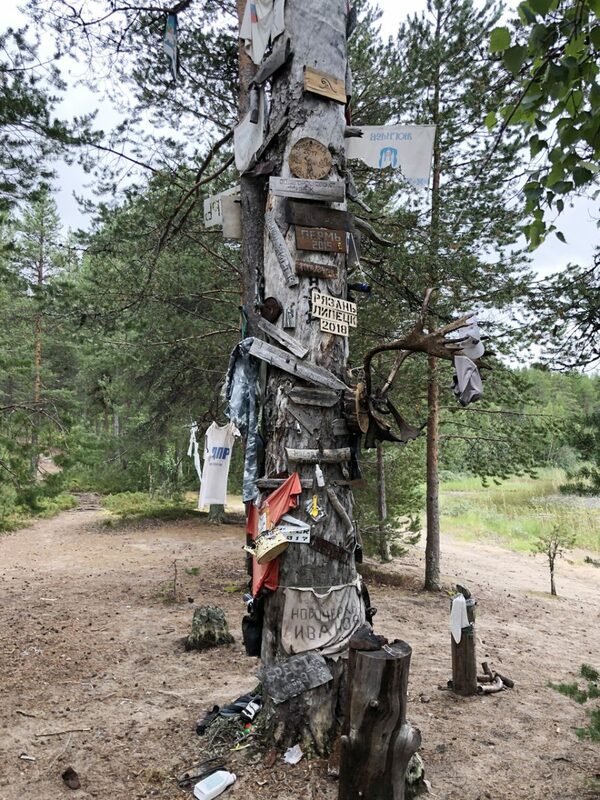 “You will recognize this place by a big dry tree covered in presents left by previous groups,” said one of the trip reports that we read before. And it was absolutely true. Already from a distance we could see a totem-like tree covered in sacrificial boards and offerings inscribed with dates of the trips and places from where the people came from. From what I could see later, some of the older ones dated back to mid-90s and besides Russia, people came from Belarus, Ukraine and the Baltic states. The place itself seemed to be a favorite camping spot as there was a lot of space to pitch tents and we counted at least 5 fire rings around there. And it made a lot of sense actually – if you have to unpack your stuff for portaging anyways, you might as well camp there. And that was what we decided to do as well even though it was just 5 pm. 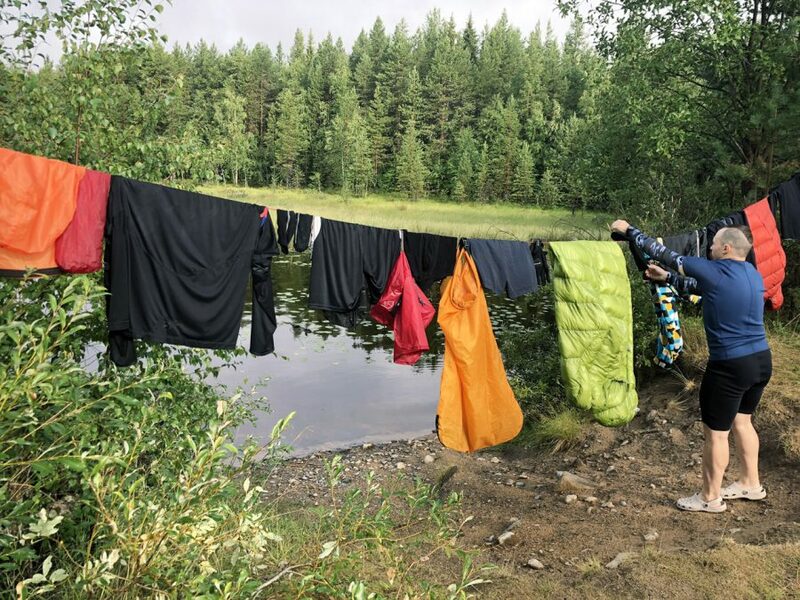 The weather seemed to be nice too and we wanted to use this chance to dry our gear that was still a bit damp after the previous day. That evening we had a feast. 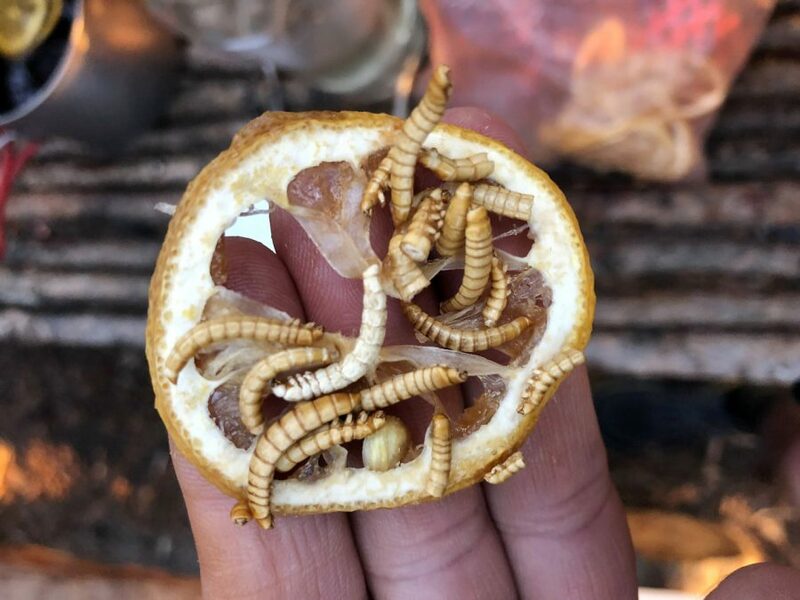 Besides the regular dinner that came from the rations, we had some pancakes made Dobrusha, some fish caught by Vadim (and masterfully prepared by Lev who resumed his duties as a Reaper) and a special treat – freeze-dried mealworms on dried lemon slices. When preparing the trip, Ilmar jokingly said that if hungry, we would eat even worms. “I take this as a promise” I told him and packed a small package of freeze-dried mealworms that I had bought in a supermarket in the Netherlands a while before but never had a good occasion to eat. They actually did not taste that bad, and while not everyone liked them, Ilmar seemed to enjoy the snack. A strong evening sun casting long shadows from the trees on the beach was followed by a beautiful sunset. Good food, warm fire and nice conversations made us all forget about the misery of the previous day, which seemed to be nothing more than a nightmare. Life felt good and we really enjoyed it. By the time I woke up next morning, Sashuk was gone. He took a broken landing net, which was one of the offerings to the trail gods, fixed it and was out fishing from the packraft. When he returned, he proudly presented half a dozen large perches that he managed to catch within less than an hour. However, superstitious Vadim was not happy. 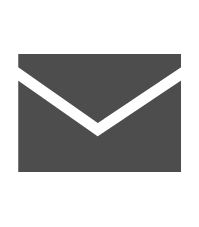 “You should not have used the net. This will bring bad luck, you know.” And he turned out to be right. 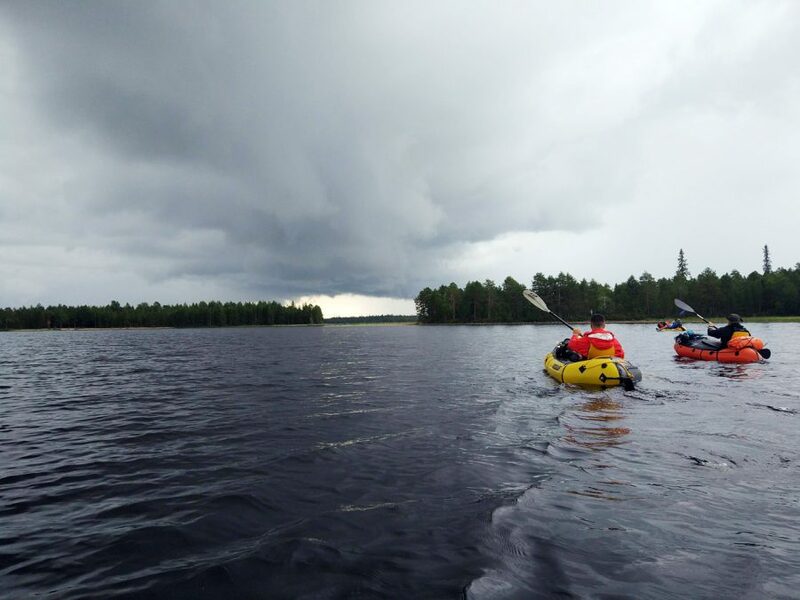 After the short portage, we paddled around 5 km along Lake Muramozero, which was the last big lake on our trip. But just when we were about to leave it, we saw ominous, angry dark clouds approaching us. Ten minutes later, we were in the middle of a downpour again. And this time just in front of the rapids. 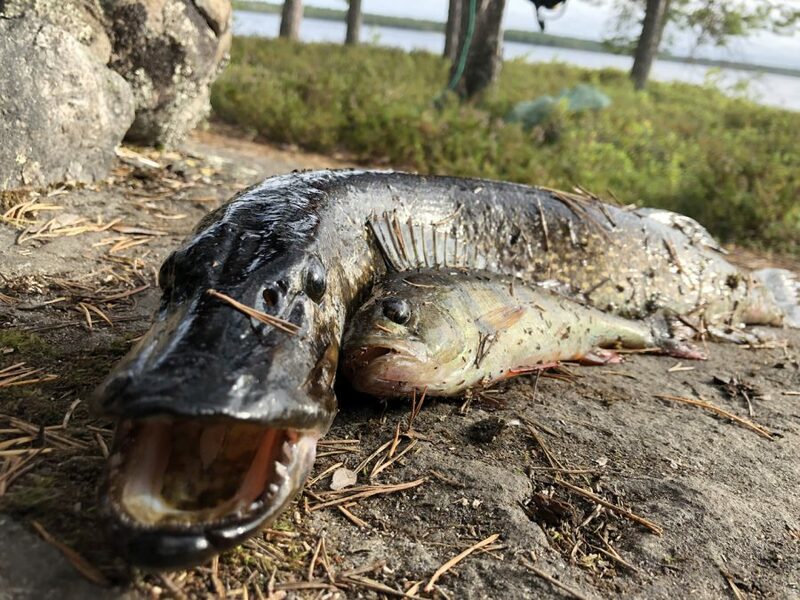 Luckily for me, I had my drysuit on. Others were not so fortunate. The rain water was so cold that we had to warm our hand up by dipping them in the river. Even when the rain calmed down, it still felt very cold. But all this extra rain water did not make much difference for the water level, as all the rapids that day had barely enough water for us to pass them without actually walking with our packrafts. It still felt like driving bumper cars. Especially Vadim and Nick were getting desperate. 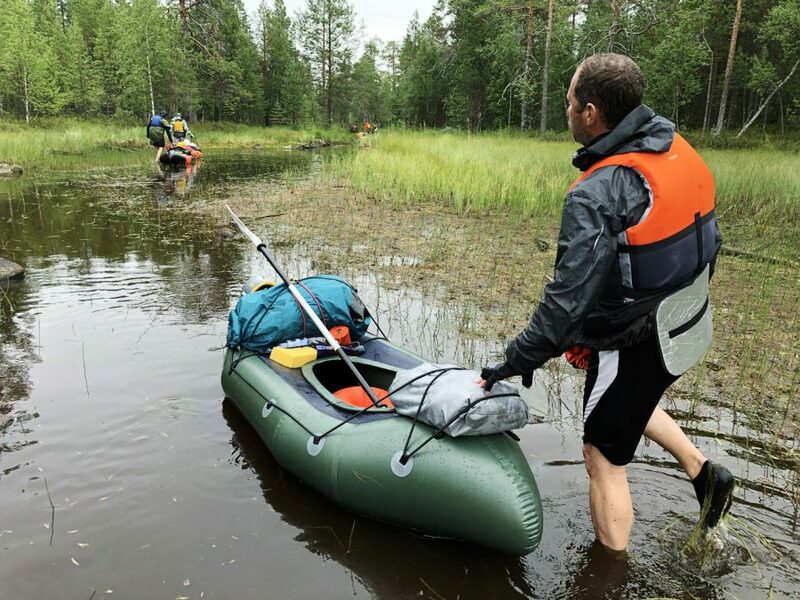 Vadim could hardly see where he was going because of a huge backpack on the bow of his packraft. As for Nick, by then the bottom of his boat looked like someone had fired a shotgun at it. He was wet and cold. And not in his best mood. 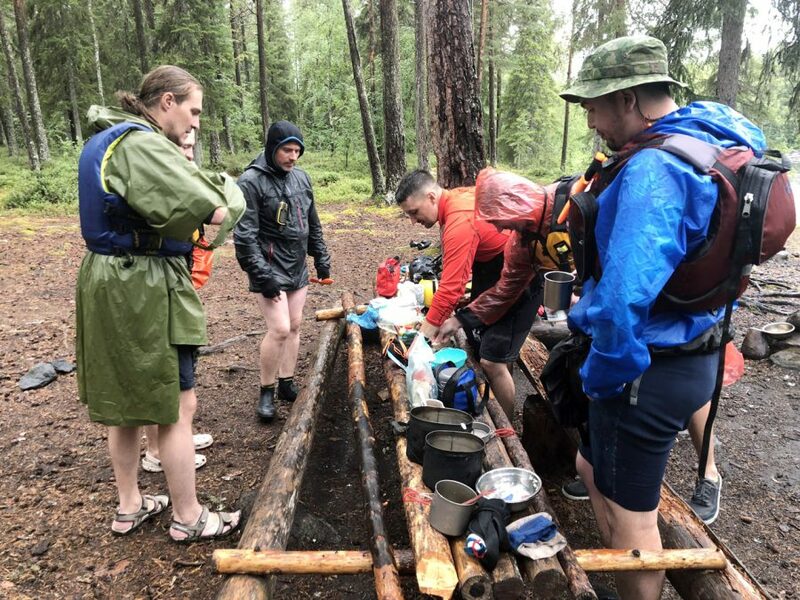 To make things worse, we had already been paddling for over 5 hours, without having anything substantial to eat (a muesli bar as an ‘on the go’ snack was definitely not enough). At the same time, there seemed to be no good places for a stop – the river banks were steep and unwelcoming. 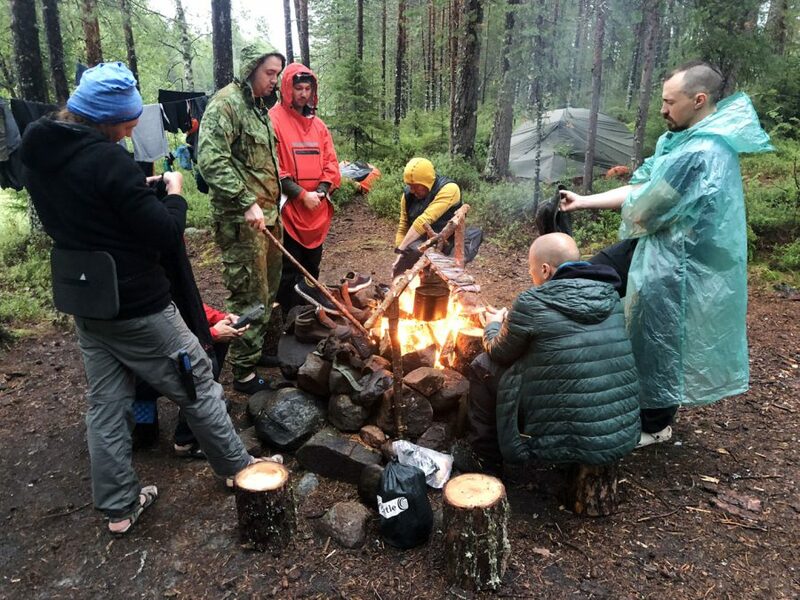 And even if we had found a good place, it would take us really long time to start a fire in such weather as all wood was soaking wet. Fortunately, our luck was about to change again as we saw a couple of catamarans next to the water and some smoke rising from a camp above. And where there is smoke, there is fire. Literally. “Let’s see if we could ask them if we could use their fire,” decided we and landed just a bit up the river. 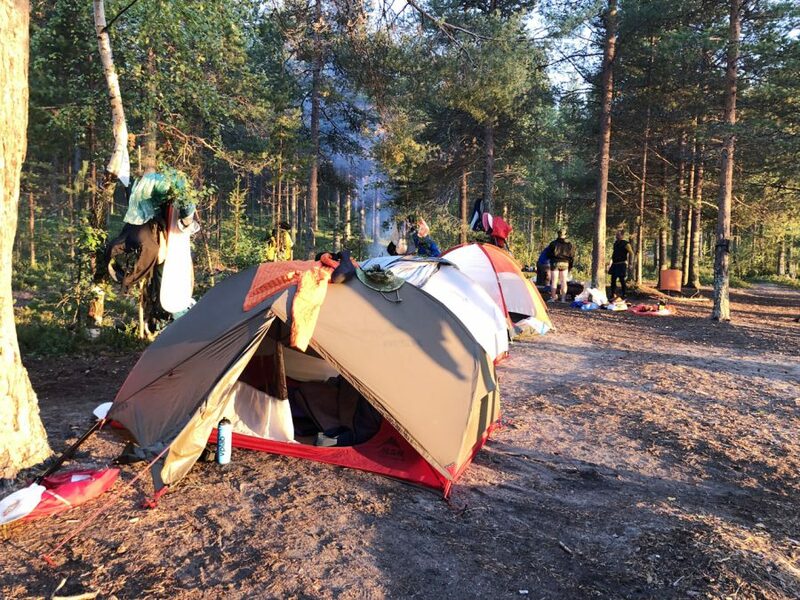 While other guys got all dishes ready, Dobrusha and I went to the camp, where we were greeted by two women (a younger and an older one), two teenage boys and a middle-aged guy. “Would it be possible to use your fire to boil some water?” we asked. They looked at us and nodded. Apparently, we looked so miserable that they did not only said yes, but one of the women (the younger one), offered us the leftovers of their lunch – boiled pasta with sugar on the bottom of a bucket-sized pot. A couple of spoons of this per person improved our moods and gave us energy to wait for our own lunch, which came very quickly. As a matter of fact, at just 30 minutes that was the quickest lunch break we ever had (usually it would be 1-1.5 hours). As we did not have the time to fix the holes on Nick’s raft, Nick dreaded the moment of getting back into the boat. 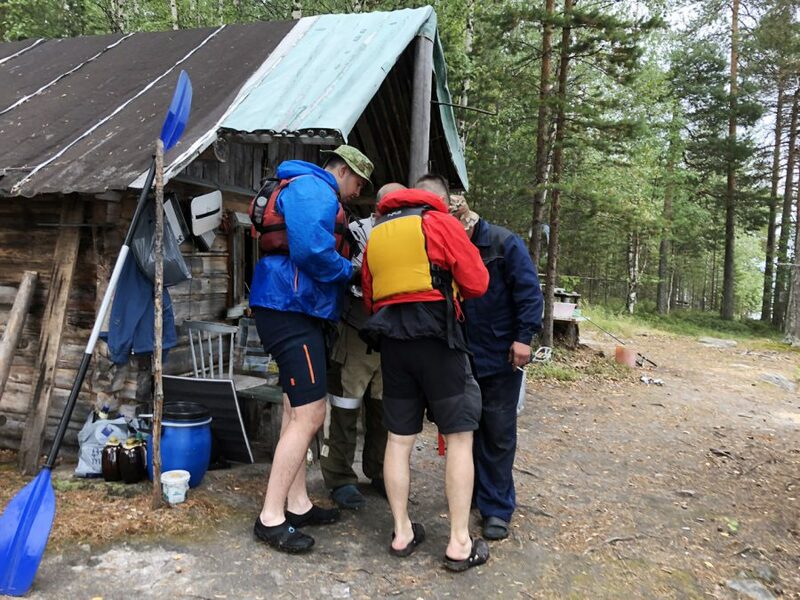 That is why Ilmar asked me if I could swap packrafts with him for the day – eventually I was the only one in a drysuit. I agreed and it clearly improved Nick’s mood. When we were passing the camp of our saviors, we shouted “Thank you” in unison. “You guys look like a herd of ladybugs,” laughed the younger woman cheerfully. ‘A heard of ladybugs’ – what a nice and cute name! First the lunch, now this – the luck was definitely on our side. And with such happy thoughts in mind we cleared another rapid, passed Lake Gagarino and reached Lake Kodaguba, the place where we decided to camp that night. As Vadim and Sashuk were fishing again, I also wanted to try my hand at it, as I had not done this in years. That is why I was so happy when I got a large perch followed by a tiny pike – the first one in my life. “Such pike is called a pencil,” said Vadim. “Because it is so small. 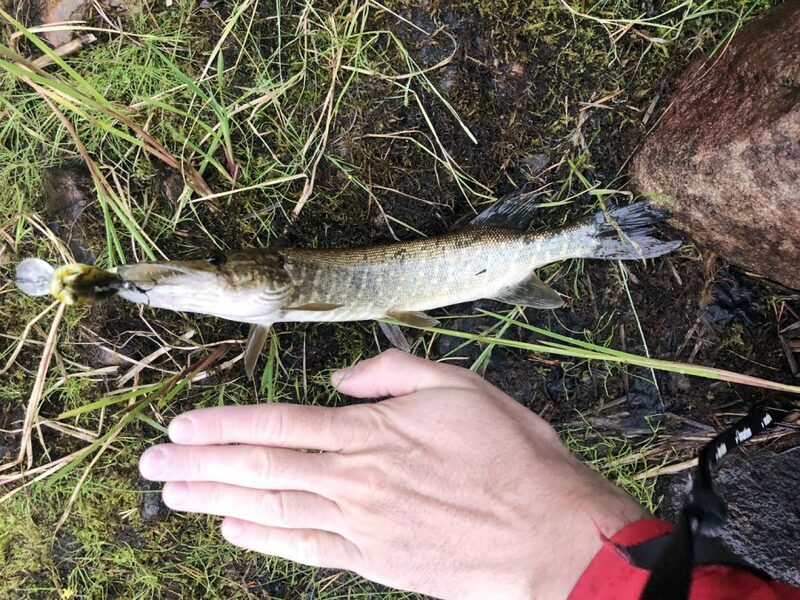 Like a pencil.” Small or not, it was all the same for me – it was my first pike and it tasted great (mostly thanks to the cooking skills of Lev the Reaper). Encouraged by my luck, I tried to search for mushrooms again, but to no avail. Even though it rained already heavily twice in the last few days, it was still too dry for them. With this long day coming to its end, we huddled around the fire, warming ourselves up and talked quietly. We were wet and tired, but not defeated. The fact that we already covered more than half of the planned route made us happy and hopeful that this ‘herd of ladybugs’ can succeed in finishing what we started. And, thus, Day 5 was over.